When I saw this photo, I begged Brandon to let me post it here along with his commentary. Take it way, Brandon! Hey Shagg, thank you for offering to post my story! I find it quite comical that everyone always told me that if I keep reading all these comics, playing these video games, and watching all that TV you’re going to die alone. Boy did I get to prove them wrong! At first Annalyssa (my fiancée) was not crazy about my hobbies but she grew to love them (not as much as myself I’m sure). The one thing that really clicked with her as far as my addictions was Doctor Who. I got her hook line and sinker with that one, so much so that I actually proposed to her in front of Matt Smith himself (and the other 2,000 people at the panel)! It was nerve racking but she said yes, would have been a long walk out of the convention center if she hadn’t. Her favourite superhero is Spider-Man and mine is well… obvious. 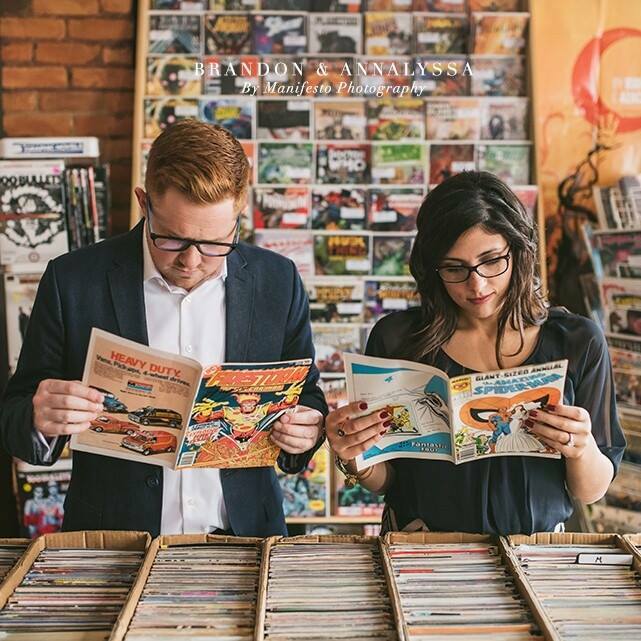 After all of my obsessions she still agreed to take our engagement pictures in a comic book store, dream come true. This is one of the photos that our photographer Manifesto Photography had taken, they were great. Anyways I had rambled on long enough, Thank you for my ten minutes of fame! Such a great story! I’m so happy for Brandon and Annalyssa. She likes comics and Doctor Who?!? Better hold on to her tight, Brandon! She sounds like a keeper! I guess you could say it’s a match(head) made in heaven! Support Firestorm (and Brandon & Annalyssa)! Fan the flame! Congratulations to Brandon and Annalyssa, they look and sound a wonderful pair! Mazel tov Brandon and Annalyssa! What an amazing picture!